Author and coach Julie Watson reminds us that God calls us into places where we feel incompetent or are just too full of fear to move forward (think of Moses). But He meets us in our “gaps,” and He grows us when we say “yes” despite our objections to the challenges we face. Julie reveals the surprising truth about the training, education, or preparation needed to pursue your dream. Finally, she asks a poignant question that helps us think about what we really want for our life and our dream. 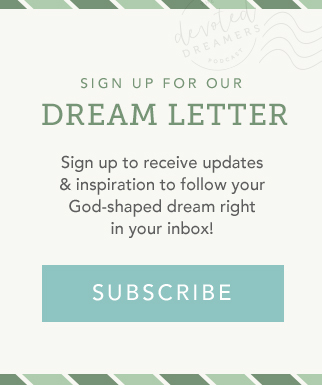 Author Kasey Shuler talks about paying attention to what brings us joy to find the keys to our God-shaped dream. She reminds us that our dreaming begins with resting in the Lord and that this “rest” isn’t necessarily about sleep. Our souls also need rest and the place we find that is in Him. When we let go of our striving and focus on Him, we’ll learn to rest in Him and trust Him for the outcome. Author Sarah Beth Marr talks about her experience of dreaming with God and her process of writing her book of the same name. She offers perspective on dreams that unfold slowly. She encourages us to look for the “little jewels of direction” and “divine sparks” from God to help us uncover our dreams. 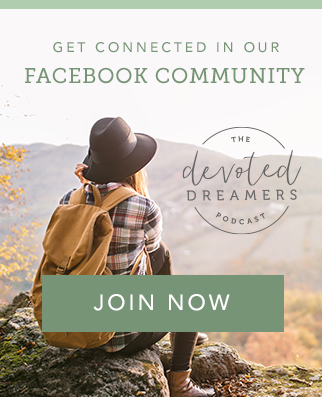 She also shares about where our feelings of restless might come from as well as how you can dream with grace, take the pressure off and just make a dent in the dream you feel like God’s given you. In this interview, author Beth Bruno talks about her unexpected journey to becoming a writer, her passion to spark a mother-daughter movement that changes the world, and the questions we must ask ourselves as we investigate our God-shaped dream. In this interview, Dorcas Cheng-Tozun reminds us a that just because the path is difficult, or we cannot see the fruit of our work, or that we feel stuck and alone in this moment, that doesn’t mean God’s not with us or we’re not following the right dream. She also shares about the value of knowing yourself and learning to accept and embrace who God made you. She reminds us about keeping the Sabbath and that no matter your calling, you need breaks from work, technology, and the day-to-day demands. And finally, she suggests that if you’re feeling stuck it might just be God inviting you into deeper communion with Him. Darcy Wiley is a writer who digs to find the transforming work of God in unexpected places. She is co-writer of the book “The Yes Effect: Accepting God’s Invitation to Transform the World Around You” (with Moody Publishers) in partnership with Luis Bush, the missions strategist who originated the 10/40 Window Movement. She is an explorer at heart. As a youth, she traveled to observe movements of God and serve on mission in various regions of the world. Nowadays, her primary mission is to raise her kids to be curious and compassionate citizens of the world. Her writing casts light on beauty and brokenness and helps readers cultivate deep, vibrant relationships with God and others. Eryn Lynum lives in Northern Colorado with her husband and three boys, where they spend their time hiking, camping, and exploring the Rocky Mountains. Her work and passion is to come alongside of authors and help them market the message God has laid on their hearts. She loves to travel and share at conferences, churches, and writers’ groups. But every opportunity she gets, she is out exploring God’s creation with her family. As the author of 936 Pennies: Discovering the Joy of Intentional Parenting, available in February of 2018, Eryn talks about the shift towards intentional parenting that happened when she and her husband were faced with the reality that they have only 936 weeks – from birth to 18 – with each of their three boys.